If you know how to cook, and even if you don’t really, chances are you can scramble eggs — a skillet of scrambled eggs is one of the quickest, simplest dishes around and often the first thing a new cook learns to make. Scrambled eggs also happen to be good for you — they’re packed with protein and nutrients such as vitamin D. Plus, they're inexpensive — a dozen eggs costs less than three dollars. 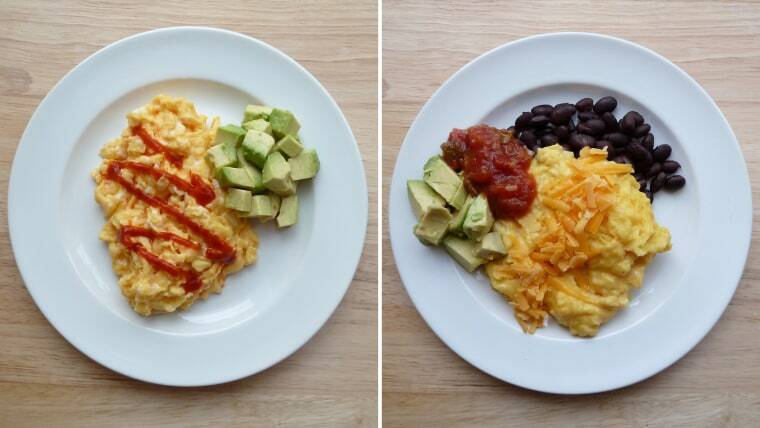 The only downside to scrambled eggs is that because they are so basic, they can also be kind of boring. The good news is that like omelets, frittatas and other eggs dishes, scrambled eggs are incredibly versatile, and partner well with a variety of different ingredients, from cheese to herbs to leftover veggies. These 11 recipes will help you put a fresh spin on your old scramble. Most are made with what’s likely already in your fridge or pantry, and some even make use of leftovers. Each recipe uses three large eggs and serves one, but feel free to increase the quantities to feed the whole family. And don't just think of scrambled eggs at breakfast time — any of these variations would make a great speedy lunch or dinner. Before you get started, here’s a quick refresher on how to make light and fluffy scrambled eggs. The recipes below are all based on this method, but feel free to use your own scramble strategy. In a medium nonstick skillet, melt 1/2 tablespoon of butter over medium-low heat (or substitute olive oil or another oil for the butter). In a bowl, whisk three large eggs until they’re an even yellow color. Add the eggs to the skillet and cook, stirring frequently with a heatproof rubber spatula, until the eggs are cooked to your liking, four to five minutes, then season with salt and pepper. It’s that easy! Now all that’s left to do is pick the first recipe you want to try, so grab your eggs and get cracking! 1. Spinach and feta: In a medium nonstick skillet, melt 1/2 tablespoon of butter over medium-low heat. Add a handful of spinach and sauté until wilted, 2 minutes. Whisk 3 large eggs until they’re an even yellow color. Add the eggs to the skillet, sprinkle with 1 tablespoon of crumbled feta and cook, stirring frequently with a heatproof rubber spatula, until the eggs are cooked to your liking, 4-5 minutes. Season with salt and pepper; garnish with additional feta. 2. Fresh herbs and cheese: In a medium nonstick skillet, melt 1/2 tablespoon of butter over medium-low heat. Whisk 3 large eggs until they’re an even yellow color. Add the eggs to the skillet and cook, stirring frequently with a heatproof rubber spatula. About 1 minute before the eggs are ready, add 2 tablespoons of chopped fresh herbs (parsley and chives are a good combo) and 1 tablespoon of freshly grated cheese (try Parmesan or Gruyère), stir and continue cooking until the eggs are cooked to your liking. Season with salt and pepper; garnish with additional herbs and/or cheese. 3. Brussels sprouts and quinoa: In a medium nonstick skillet, melt 1/2 tablespoon of olive oil over medium-low heat. Add 1/4 cup of leftover cooked and chopped Brussels sprouts (roasted sprouts are particularly good here) and 1/4 cup of leftover cooked quinoa and sauté for 1-2 minutes. Whisk 3 large eggs until they’re an even yellow color. Add the eggs to the skillet and cook, stirring frequently with a heatproof rubber spatula, until the eggs are cooked to your liking, 4-5 minutes. Season with salt and pepper; garnish with hot sauce. 4. Cauliflower, red onion and cheddar: In a medium nonstick skillet, heat 1/2 tablespoon of olive oil over medium-low heat. Add a couple thin slices of red onion and sauté until softened and starting to brown, 8 minutes. Add 1/4 cup of leftover cooked and chopped cauliflower and sauté for 1 minute. Whisk together 3 large eggs until they’re an even yellow color. Add the eggs to the skillet and cook, stirring frequently with a heatproof rubber spatula. About 1 minute before the eggs are ready, add 1 tablespoon of grated cheddar, stir and continue cooking until the eggs are cooked to your liking. Season with salt and pepper; garnish with additional grated cheddar. 5. Parmesan and pesto: In a medium nonstick skillet, melt 1/2 tablespoon of butter over medium-low heat. Whisk 3 large eggs until they’re an even yellow color. Add the eggs to the skillet and cook, stirring frequently with a heatproof rubber spatula. About 1 minute before the eggs are ready, add 1-2 tablespoons of pesto, stir and continue cooking until the eggs are cooked to your liking. Season with salt and pepper; garnish with freshly grated Parmesan. 6. Potatoes and crispy bacon: In a medium nonstick skillet, cook 1 slice of bacon until crispy. Remove, let cool, then crumble into small pieces. Pour off all but 1 tablespoon of the fat from the skillet, then place over medium-low heat. Add 1/3 cup of leftover cooked and cubed potatoes and sauté until crispy, 2 minutes. Whisk together 3 large eggs until they’re an even yellow color. Add the eggs to the skillet and cook, stirring frequently with a heatproof rubber spatula, until the eggs are cooked to your liking, 4-5 minutes. Season with salt and pepper; garnish with the crumbled crispy bacon. 7. Smoked salmon, cream cheese and chives: In a medium nonstick skillet, melt 1/2 tablespoon of butter over medium-low heat. Whisk 3 large eggs until they’re an even yellow color. Add the eggs to the skillet and cook, stirring frequently with a heatproof rubber spatula. About 2 minutes before the eggs are ready, add 2 ounces of cubed cream cheese, stir and continue cooking for 1 minute. Add 1 ounce of chopped smoked salmon, stir and continue cooking until the eggs are cooked to your liking. Season with salt and pepper; garnish with chopped fresh chives. 8. Sriracha and avocado: In a medium nonstick skillet, melt 1/2 tablespoon of butter over medium-low heat. Whisk 3 large eggs until they’re an even yellow color. Add the eggs to the skillet and cook, stirring frequently with a heatproof rubber spatula, until the eggs are cooked to your liking, 4-5 minutes. Season with salt and pepper; drizzle with Sriracha or another hot sauce, and serve with 1/2 diced avocado. 9. Curried potatoes and peas: Blanch 2 tablespoons of fresh or frozen peas. In a medium nonstick skillet, heat 1/2 tablespoon of olive oil over medium-low heat. Add 1/4 cup of leftover cooked and cubed potatoes and 1/4 teaspoon of curry powder, and sauté until crispy, 2 minutes. Whisk together 3 large eggs until they’re an even yellow color. Add the eggs to the skillet and cook, stirring frequently with a heatproof rubber spatula, until the eggs are cooked to your liking, 4-5 minutes. Season with salt and pepper. 10. Black beans, cheese, salsa and avocado: In a small saucepan, warm 1/3 cup of drained and rinsed black beans over medium-low heat (or heat the beans in the microwave in a lidded microwave-safe container). In a medium nonstick skillet, melt 1/2 tablespoon of butter over medium-low heat. Whisk 3 large eggs until they’re an even yellow color. Add the eggs to the skillet and cook, stirring frequently with a heatproof rubber spatula, until the eggs are cooked to your liking, 4-5 minutes. Season with salt and pepper; serve with the warm beans, 1 tablespoon of grated cheddar or jack cheese, salsa and 1/2 diced avocado. 11. Caramelized onion, apple and blue cheese: In a medium nonstick skillet, heat 1/2 tablespoon of olive oil over medium-low heat. Add a couple thin slices of onion and sauté until softened and starting to brown, 8 minutes. Add 1/2 peeled and thinly sliced apple and sauté until softened, 5 minutes. Whisk 3 large eggs until they’re an even yellow color. Add the eggs to the skillet and cook, stirring frequently with a heatproof rubber spatula. About 1 minute before the eggs are ready, add 1 tablespoon of crumbled blue cheese, stir and continue cooking until the eggs are cooked to your liking. Season with salt and pepper; garnish with additional blue cheese.